Face Value: It works. I might not be head over heels for this cover, but it offers up a classic fairy tale vibe while still looking like a book published in 2011. And while the illustration of Reveka might be ever-so-slightly glammed up, she still looks young enough and tough enough to be the character we come to know in the story. I do think the cover reads a little younger than the book itself does – especially the second half. Does it Break the Slate? Yes! This is that really good kind of revisionist fairy tale, where it exists completely in a “once-upon-a-time” place, but inserts feminist values into that setting. Reveka is smart and capable and the instrument of her own saving. She’s not the only smart and capable girl in these pages either. The princesses are fascinating, and not without their own motives (even if they don’t ultimately demonstrate the strength Reveka does), and she is aided in her quest by a number of wise, brave individuals, both male and female. Neither The Twelve Dancing Princesses nor Beauty and the Beast are inherently female-empowering narratives in their original form, and it’s nice to see Merrie Haskell infuse a healthy dose of feminism into a retelling of both these two stories. Who would we give it to? This is a decently hefty book, so it’s probably a little beyond girls who are immersed in the Disney Princess phase as an alternative. But this is a great book for readers of fairy tales. Get this one for the Gail Carson Levine reader in your life. Review: Reveka is a 13 year old herbalist’s apprentice who works at a Romanian castle where the princesses are under a mysterious curse. The twelve princesses, of course, disappear at night, wearing their dancing shoes to shreds, and nothing anyone tries can stop it. Anyone who tries to follow the princesses in their room at night finds themselves trapped in a coma-like state of eternal sleep, for which no one can find a cure. Reveka, inspired by the fabulous dowry offered to anyone who breaks the curse (well, any female – a male would get the traditional hand in marriage of one of the princesses), takes it upon herself to do so. And that’s just the first half. 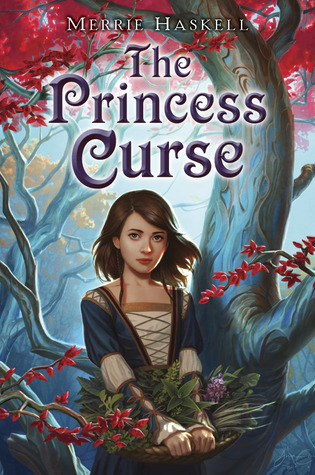 After Reveka breaks the curse, the story becomes a version of Beauty and the Beast, and one in which Reveka has to make some serious choices about her own destiny, what she values, and what her responsibility is to herself, her family, and the world at large. It’s always awesome when your fairy tale heroine has some seriously legitimate skill to back up her claims and to justify why she might think she can break the curse. And Reveka is incredibly talented and passionate about her herbary. But what’s more, her skill is not magically handed down, or somehow innate. She has good instincts, true, and natural talent. But she also works hard, and studies a tremendous amount, and puts work into being good at the thing she loves. Sometimes she fails, but often her hard work pays off. Who doesn’t love a heroine with a good work ethic? This might sound strange, but one of the things that elevated this story from other fairy tale retellings for me was Reveka’s selfishness. Especially throughout the beginning of the book, she makes no pretense that her reason for wishing to break the curse is out of the goodness of her heart, or because it’s the right thing to do. She wants to be the one to curse because of the financial reward it promises, a reward that could keep her from marrying and allow her the means to have her own herbary. She’s brusque, stubborn and impetuous. In fact, she thinks of the curse as almost beneath her. She is dismissive of the princesses and their dilemma, referring to their situation derisively as “a curse of shoes and naps.” As the story goes on, we see her grow up – not losing her sense of self or her dreams for her future, but growing to be able to include others in her priorities, to think about her place in the world on a larger scale. I don’t want to give too much away, so I’ll be careful in talking about the second half of the book. But I will say, Beauty and the Beast is one of the most misogynistic fairy tales out there, with a self-sacrificing, abused heroine who learns to love her aggressor (yes, even if you DO have a bookish heroine in the Disney version, it’s still super creepy). That’s really not how this version goes. I was impressed with the way Haskell maintained Reveka’s agency, and made her decisions thoughtful and her own. All in all, this added up to one of my favorite fairy tale retellings in recent years. This entry was posted in Middle Grade, Reviews and tagged Fairy Tales, Fantasy, Magic, Merrie Haskell, Middle Grade, Princesses, Retellings. Bookmark the permalink. I agree, though I was satisfied with the way this was ultimately resolved (cryptic enough to not be spoilery? we’ll see:). It’s interesting because Haskell set up quite a few references to “child brides” without drawing much negative attention to it. I found the early references to Daciana, and how comfortable everyone seemed with a wife younger than most of the daughters to be more jarring than Reveka’s choice to save her father, especially since it’s clear there’s nothing physical that happens between them. While I did feel like it was very much part of Haskell trying to recreate the time period, I can definitely see why you’d have trouble with that aspect. Would you still recommend it as a middle grade title?